The San Diego Regional Chamber of Commerce board of directors voted Thursday to endorse the SDSU West ballot initiative for development of the former Qualcomm Stadium property in Mission Valley. The endorsement came during a special meeting of the board at which representatives from both SDSU West and SoccerCity presented their plans and answered questions. “The redevelopment of the Mission Valley site will have a long-term impact on the entire San Diego region and we want to ensure that the plan that moves forward is in the best interest of businesses and the San Diego community as a whole,” said Chamber President and CEO Jerry Sanders. Both initiatives will be on the November general election ballot, and the one with the most votes over 50 percent would guide development of the property. 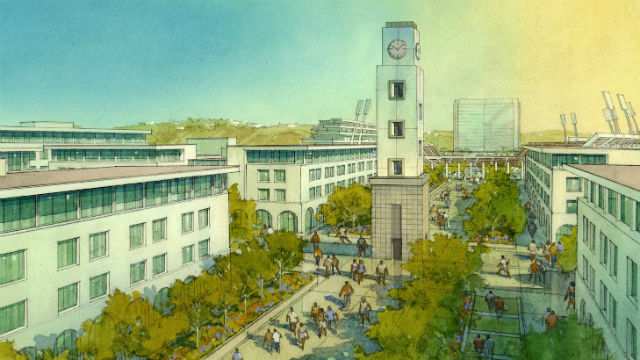 The SDSU West initiative would implement San Diego State University’s Mission Valley site plan, which calls for a new 35,000-seat stadium for Aztecs football and soccer, hotels, retail buildings, an academic campus and river park. The competing initiative for SoccerCity also proposes mixed-use spaces and a river park, plus a 23,500-seat professional soccer stadium that could be expanded to accommodate Aztecs football. Sanders noted that the SDSU West initiative would permit significant community input, which he said would allow for the final product to best reflect what the community wants for the city. Friends of SDSU, a group of alumni, community and business leaders backing SDSU West, praised the chamber’s action. “We’re honored the San Diego Regional Chamber of Commerce has recognized SDSU West as the only initiative that will bolster higher education opportunities and our regional economy for generations to come,” said SDSU West spokesperson Katy Temple.